Binario is very interesting mind game in which one has to place 0 and 1 in each row/column such that there is no three 0s or 1s continously. Also each row/column is unique and does not repeat anywhere. 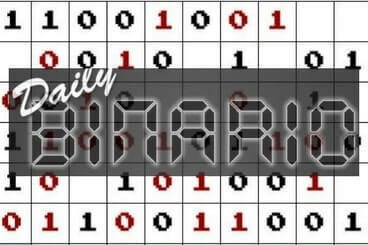 Every day new Binary Puzzles in 4 sizes: 6x6, 8x8, 10x10 and 12x12. Use logic to solve the puzzles. 1) No more than two the same numbers may be placed directly next to or below each other. 2) Every row and every column must contain as many zeroes as ones. The combination of zeroes and ones in every row is unique. The same applies to every column.